(Nanowerk Spotlight) Graphene, as the fundamental two-dimensional (2D) carbon structure with exceptionally high electronic quality and chemical sensitivity, has emerged as a promising nanomaterial platform for many potential applications of gas, chemical, molecular and infectious sensors of various types. For instance, in previous Nanowerk Spotlights we have reported on graphene-based magnetic field sensors ("Record high sensitive graphene Hall sensors"), humidity sensors ("Ultrafast graphene sensor monitors your breath while you speak"), optical sensors ("Graphene-based optical sensor detects single cancer cells"), gas sensors ("Selective gas sensing with pristine graphene"), analyte sensors ("Graphene nanosensor tattoo on teeth monitors bacteria in your mouth"), or strain sensors ("Wearable graphene strain sensors monitor human vital signs"). The latest example of nanotechnology in healthcare is a graphene-based wireless sensor that could make 24-hour healthcare easier to achieve by enabling wireless monitoring of various biomedical events in order to gain a more comprehensive assessment of the wearer's healthcare status. This novel device, which detects chemical/molecular agents and lengths of exposure, can be used as lightweight and transparent wearable or bio-implantable electronic sensor. It may provide an inexpensive way to detect in real-time the biomedical of interest. "In our recent work we have demonstrated that graphene field-effect transistors (GFETs) can offer simultaneous radio-frequency modulation, chemical sensing and memory effects in a single component," Pai-Yen Chen, Assistant Professor in the Department of Electrical and Computer Engineering at Wayne State University, tells Nanowerk. Chen, together with Prof. Deji Akinwande at the University of Texas at Austin, and their teams, have reported their findings in the May 9, 2016 online edition of Nature's Microsystems & Nanoengineering ("Chemical-sensitive graphene modulator with a memory effect for internet-of-things applications"; open access), first authored by Dr. Haiyu Haung at Maxim Integrated Corp. Co-authors also include Prof. Mark M. C. Cheng at the Wayne State University and Dr. Tony Hu at the Methodist Hospital Research Institute. The team's multifunctional nanosensor-modulator combines (RF) frequency modulation, sensing, and an analog memory effect to record the history of various chemical events, , even with a single graphene transistor. This is, however, not possible with conventional solid-state electronic devices. 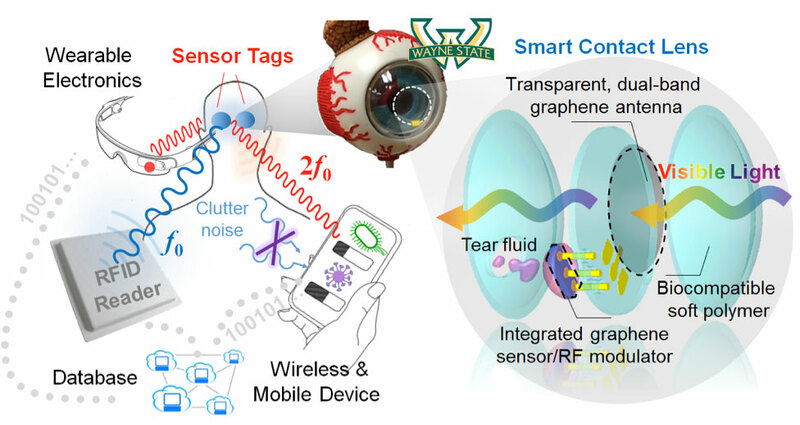 "This new frequency-modulated sensing paradigm may enable the development of practical graphene-based nanosensors with wireless connectivity for the continuous monitoring of surface chemical events," Huang points out. The back-gated graphene device demonstrates a distinct conversion of a radio signal’s frequency, when introduced to reducing or oxidizing chemical gases, or to more complex substances, such as protein biomarkers. "We envision that this monolithically integrated nanomaterial sensor may potentially benefit a number of wireless sensing and diagnosis applications, particularly for smart contact lenses/glasses and microscope slides that require not only high sensitivity, but also light weight, flexibility, and high optical transparency," notes Chen. In addition, once multiple graphene transistors are used to build a more complicated circuity, such as the quad-ring topology, the sensor can be activated by the wireless power transfer, without any need for a battery. This represents numerous possibilities for pervasive healthcare Internet of Things (IoT) devices and ubiquitous sensor networks. This biosensor is devised for detecting the infectious keratitis, which is a sight-threatening ophthalmic disease caused by corneal infections due to the exposure of pathogens. The disease can be devastating, and the cornea may be irreversibly damaged within 24 to 48 hours by virulent organisms. However, conventional microbiological methods for pathogen detection are time-consuming and labor-intensive, requiring many days to culture the micro-organisms and determine sensitivities to treatment. Early diagnosis and treatment enabled by this continuously monitoring smart contact lens could be instrumental in minimizing any irreversible vision loss. "Graphene has almost limitless potential in terms of its excellent electronic property and chemical sensitivity," Chen concludes. "Moreover, it is transparent for visible light and is mechanically strong and stretchable, making it suitable for wearable sensor applications we are currently envisioning, not limited to smart contact lens." Practical integration of all-graphene IoT and wireless sensors is still at its early stages, but the potential of this technology is very exciting.